Field Projects is pleased to present EXCAVATIONS, curated by Rachel Frank. 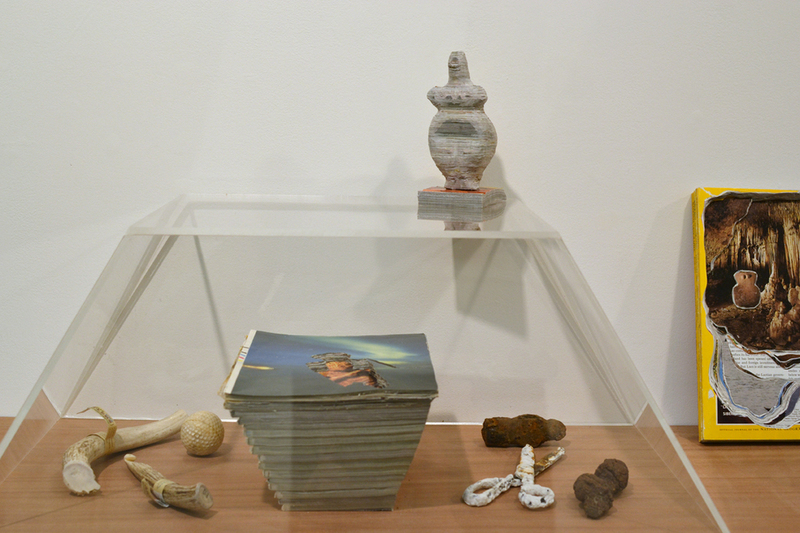 The exhibition features work by Ellie Krakow, Susan Metrican, Julie Ann Nagle, and Arthur Simms. EXCAVATIONS implies a physicality and a process, a fragment or part beneath the surface to be dug up, resurfaced, or revived. 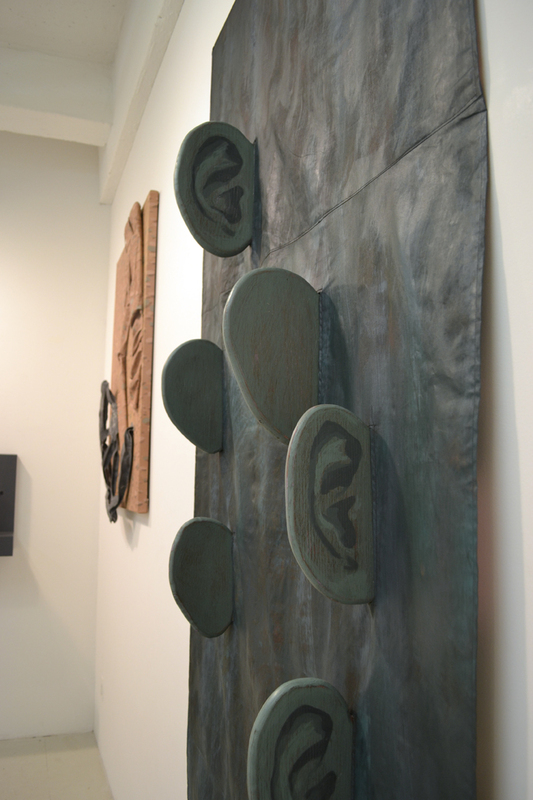 The artists in this exhibition use a wide range of disciplines—sculpture, photography, installation, and painting—to explore themes of memory, origin, and history. 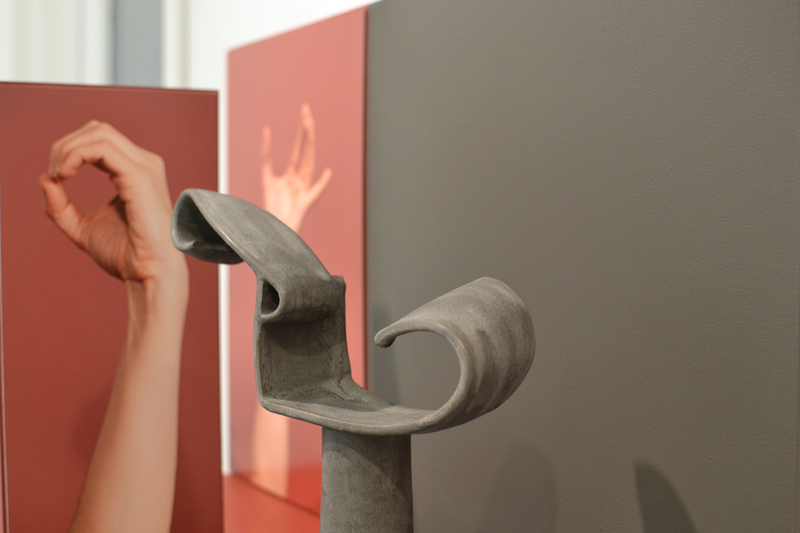 Treating language as a collection of sounds, words, and gestures, the works connect the past to the present, reimagining and transforming everyday objects from various times and cultures and unearthing unconscious meanings. Care is given to what is lost, discarded, elusive, or in the process of disappearing. Implying there are blank spaces or missing parts between these glimpses or slits in time, the reviving or excavating process serves to prolong, preserve, or highlight that which is just out of one’s grasp. Ellie Krakow is an interdisciplinary artist based in New York City. Her work focuses on the armature as a support or prop display used in both early portrait photography to hold subjects still for long exposures and as a museum framework used to present and protect ancient fragments and relics. 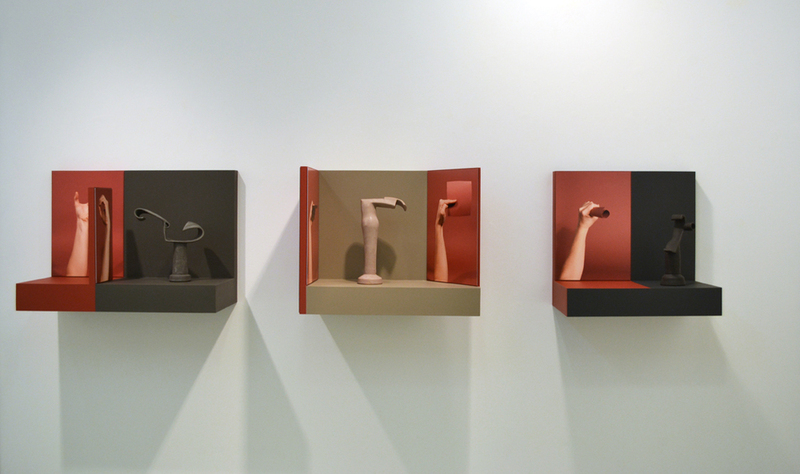 Using clay, she reimagines and recreates armatures for hand and arm gestures, photographing them using conventional studio photography, and displays them, transforming and memorializing the common everyday movements of the body. Giving elevated and transformative value to these fleeting gestures, she examines both the loss and posturing that armatures and display structures represent. Based in Boston, Massachusetts, Susan Metrican utilizes a mixture of painting and sculpture to examine the split between the body and its visual perception. Offering works that are at times theatrical and playful, Metrican uses textural illusions and trompe l’oeil tactics to distort the viewer’s perceptions. Evocative of the artifice, her paintings operate as a sort of mise-en-scene, comparing and contrasting the surface to the illusion and the real to the represented. With references to word play in her titling and use of symbols, Metrican’s work explores illusive and ambiguous spaces in language, perception, and body. 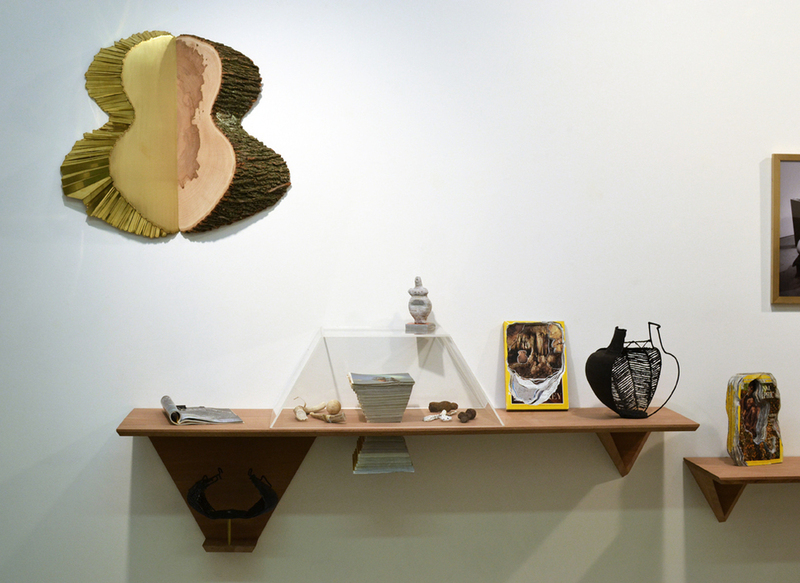 New York City based artist, Julie Ann Nagle explores the performative nature of objects and monumentalization of history through sculpture, installation, and photography. Often creating immersive environments, her work combines archaeology, modernism, and the female form, making spaces for potential performances or actions. Using the ubiquitous National Geographic magazine, she carves, cuts, and excises layers of imagery. Creating new images through these transformed juxtapositions of magazine pages, her work re-examines our relationship to history as a passageway, bridging a connection to past cultures, events, objects, and places. 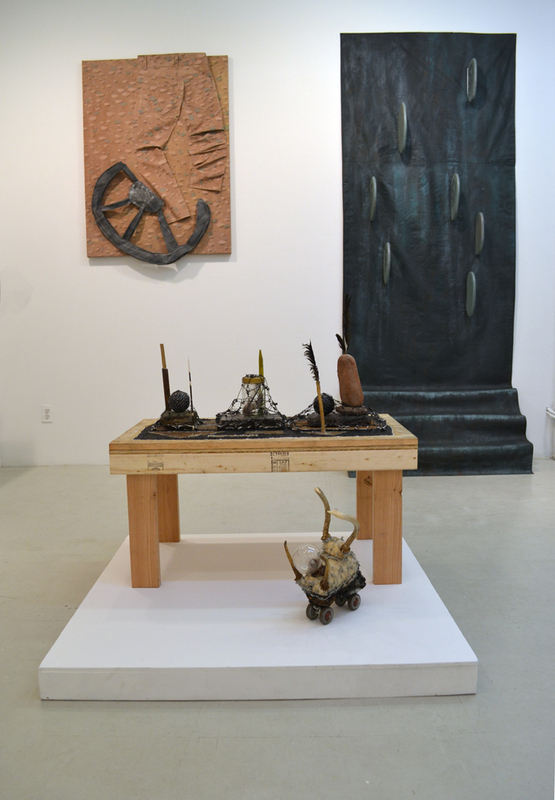 Jamaican born, New York City based artist, Arthur Simms uses found object assemblage and sculpture to explore questions of transformation and autobiographical origin, as well as the commonalities between art history and folk culture. Playfully combining disparate materials, cast-offs, and recycled items, Simms physically and meticulously binds these materials together using rope and wire. Through this method of collection and delicate, yet decisive assembly, he elevates these commonplace objects, imbuing them with meaning and creating physical and spiritual links between personal memories, language, world cultures, and his hybridized cross-cultural background. Rachel Frank is a Brooklyn-based artist working in sculpture, theater, and performance. Her work explores the tensions between the natural world and the manmade, the animal and the political, and the past and the present. She co-curates an annual video screening for the Skowhegan Alliance, which has been shown at Cabinet, Skowhegan, and Regina Rex in New York City, and at LAXART and Public Fiction in Los Angeles, CA. She recently became a co-partner and curator at Field Projects.